We have to change our food system because the solution for health care – it is actually our food system. The quality of the food we eat, and how we eat it is more important than anything else. Sadhguru and Mark Hyman, American physician and bestselling author, explore the connection between the food that we eat and our physical and mental health, as well as possible approaches to change our food system. You can find the previous parts of their conversation here: Hand Over The Forks, Folks! and Raise Your Food Consciousness. Read more to find out what Sadhguru says about food. Mark Hyman: One of the questions that came from the audience is about the connection between our mind, our mood, our emotional state, our mental health, and the food we eat. Everything from ADD to bipolar disease, to depression could be linked to that. So, what is the connection between our body and our mind? Sadhguru: The yogic system does not identify body and mind as two different entities. Your brains are part of your body. It is just that what we generally refer to as mind is a certain amount of memory and intelligence. Between the rest of the body and the brain, which has more memory, which has more intelligence? If you look at it carefully, your body’s memory goes back millions of years. It clearly remembers how your forefathers were. The mind cannot claim that kind of memory. When it comes to intelligence, what is happening in a single molecule of DNA is so complex that your whole brain cannot figure it out. In the yogic system, there is a physical body and there is a mental body. There is an intelligence and memory running right across the body. People generally think the brain is everything just because it handles the thought process. And because of this separation of body and mind, a large number of people in the West are taking antidepressants at some point in their life. The type of food we eat has a huge impact on the mind. An average American is said to consume 200 pounds of meat per year. If you bring it down to 50 pounds, you will see 75% of the people will not need antidepressants anymore. Meat is a good food to survive if you are out in the desert or the jungle. If you are lost somewhere, a piece of meat will keep you going, because it provides concentrated nourishment. But it should not be a daily food that you eat when there are other choices. When you kill an animal, the negative acids and whatever other chemicals are in the meat. There are many ways to look at this. One thing is animals have the intelligence to know in the last few moments that they are going to get killed, no matter how cunningly or how scientifically you do it. Any animal that has the capacity to express some kind of emotion will always grasp when it is going to be killed. Suppose all of you come to know right now that at the end of this day, you are going to get slaughtered. Imagine the struggle that you would go through, the burst of chemical reactions within you. An animal goes through at least some fraction of that. This means when you kill an animal, the negative acids and whatever other chemicals are in the meat. When you consume the meat, it creates unnecessary levels of mental fluctuations. If you put people who are on antidepressants on a conscious vegetarian diet, in about three months’ time, most of them will not need their medication anymore. We have seen this with many people who have come to the Isha Yoga Center. A large percentage of people cannot be mentally sick unless we are culturing it within our social fabric. For most of those who have become mentally ill, the illness has been cultivated – there is nothing pathologically wrong with them. Such a large percentage of people cannot be mentally sick unless we are culturing it within our social fabric. We should never let commercial forces determine the quality of our lives. Commerce is there to serve humanity. But right now, we have structured the economic engine across the world in such a way that human beings are here to serve the economic and commercial process. You were mentioning the World Economic Forum. When I was there a few years ago, everyone was referring to India, China, and other places as emerging markets. I said, “Please don’t refer to people as a market. If you saw them as human beings, maybe you would get the right idea as to what to do with them. If you see them as market, you will do a different thing! This is not a market. These are people.” If you don’t see people as people, if you don’t see life as life, you won’t care what you stuff into them. You will want to sell something that makes maximum money for you. Mark Hyman: Yeah. It’s true. A number of years ago, I wrote a book called The UltraMind Solution, which is about how the body affects the mind. I had seen that a lot of mental illnesses and cognitive problems were shifting as I began to treat people’s overall health. What I do is something called functional medicine. It is about the science of creating health, which is very much what Sadhguru teaches. The quality of the food we eat, and how we eat it is more important than anything else. When I began to do that and I saw people’s depression go away, and their ADD and their bipolar disease improve, and I looked at the underlying causes, it was most often the food they were eating. In fact, most people are not eating real food – they are eating food-like substances that masquerade as food. 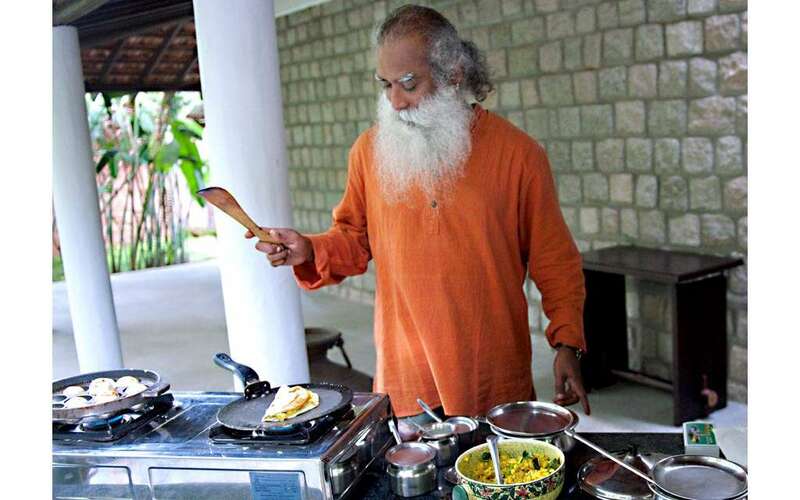 If we just stuck to real food, downsized our meat consumption, as Sadhguru says, and had a mostly plant-based diet, I think most of our chronic diseases, including mood and neurologic disorders, would go away. I have seen this over and over again. Often, I was not actually treating the mental problems, and yet, they went away as a secondary effect. I think it is really a shame that in this country, we do not have an understanding of this connection, and that doctors are still challenging the idea that food actually has an impact on our health other than making us overweight, that it can be used as a tool for healing. But it really is the most powerful tool. The quality of the food we eat, and how we eat it is more important than anything else. Sadhguru: I think we need an effective campaign for food, like the anti-smoking campaign in the US. In the 70’s, in any public place in the United States, you had to wade through smoke. Then they started an active and successful campaign that cleared up the air. Today, you can walk into a restaurant, and there is no smoke. But still there is carbon-dioxide in the drink! At one time, smoking was not just a necessity for a whole lot of people, it was fashionable. It was the right thing to blow smoke into other people’s faces. With the right kind of campaign, within one generation, this situation has changed completely. Today, you see less tobacco smoke in America than in many other countries in the world. A similarly successful campaign is needed about what we eat and what we drink. Mark Hyman: Yeah. Each of us making those choices and talking to our local politicians makes a big difference. But the problem is the kind of impact the food industry has. It is a one-trillion-dollar industry that determines a lot of policies. To a large extent, food guidelines and the FDA recommendations [Food & Drug Administration in the United States] and guidelines are actually governed by lobbying. This means we are not getting adequate information; we are not getting the truth. In fact, we are not getting policy changes. Sadhguru: Actually, it is a 4 trillion industry – one trillion food and another 3 trillion medicine. Mark Hyman: Exactly. It’s huge. Michael Bloomberg tried to change some policies in New York [when he was the Mayor]. For example the soda tax – he could not get it passed. He also wanted to do a study to see what happens when you limit the use of food stamps for soda. Food stamps pay for four billion dollars in soda every year for the poor in America – on the front end. And on the back end, the government is paying for Medicare and Medicaid [due to medical conditions resulting from the consumption of soda]. The USDA agriculture department would not even let him do a pilot study. green – good; yellow – caution; red – probably it is going to hurt you. So, he has gone to Mexico to help them with some key policies, such as a soda and sugar tax, junk food taxes, and food labeling, so you can actually know if food is good for you or bad for you: green – good; yellow – caution; red – probably it is going to hurt you. They also aim at emptying schools of any foods that harm kids, and at ending the marketing of what is not real food. These are policies that could work across the globe – in different ways in different countries. But we are allergic to such changes in this country because of the food lobbying. Yet if each of us advocates for it and makes changes in our own family, in our own communities, among our own friends, we can begin to see a global change. Sadhguru: It is not in the hands of the politicians and policymakers alone. If everyone realizes their physical and particularly their mental health improves when they change what they eat and how they eat, we will also change the politicians. Mark Hyman: Absolutely. We have to change our food system because the solution for health is not necessarily healthcare – it is actually our food system. I think addressing both together, that is creating a mindful nation and changing the food system, is the answer.